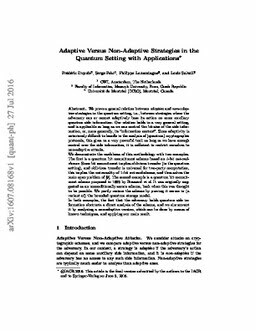 We prove a general relation between adaptive and nonadaptive strategies in the quantum setting, i.e., between strategies where the adversary can or cannot adaptively base its action on some auxiliary quantum side information. Our relation holds in a very general setting, and is applicable as long as we can control the bit-size of the side information, or, more generally, its “information content”. Since adaptivity is notoriously difficult to handle in the analysis of (quantum) cryptographic protocols, this gives us a very powerful tool: as long as we have enough control over the side information, it is sufficient to restrict ourselves to non-adaptive attacks. We demonstrate the usefulness of this methodology with two examples. The first is a quantum bit commitment scheme based on 1-bit cut-and-choose. Since bit commitment implies oblivious transfer (in the quantum setting), and oblivious transfer is universal for two-party computation, this implies the universality of 1-bit cut-and-choose, and thus solves the main open problem of . The second example is a quantum bit commitment scheme proposed in 1993 by Brassard et al. It was originally suggested as an unconditionally secure scheme, back when this was thought to be possible. We partly restore the scheme by proving it secure in (a variant of) the bounded quantum storage model. In both examples, the fact that the adversary holds quantum side information obstructs a direct analysis of the scheme, and we circumvent it by analyzing a non-adaptive version, which can be done by means of known techniques, and applying our main result.